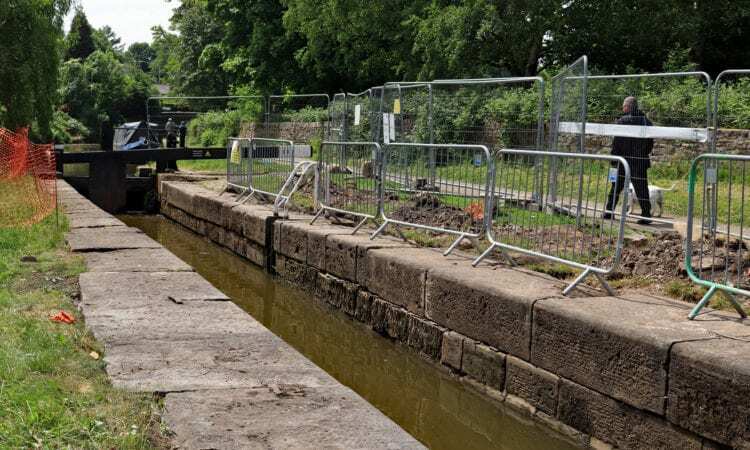 Inward-moving coping stones at a lock on the Marple flight have forced the Canal & River Trust to take action to keep the waterway open to boaters. Closed lock 11 on the Marple flight. 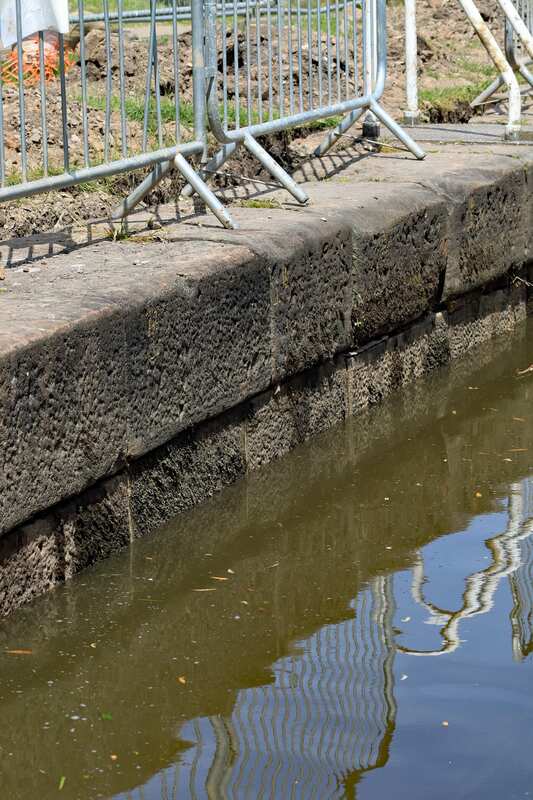 While there is some water in the lock when this picture was taken on June 5, it is possible to see where some of the coping stones have moved inwards. Photo: Colin Wareing of Colin and Carole’s Creations. 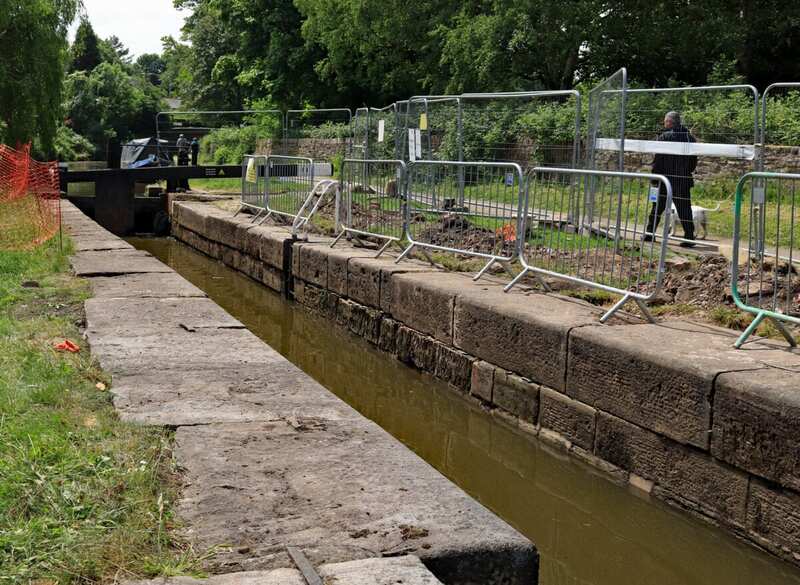 The flight of 16 locks on the Peak Forest canal in Marple to the south east of Manchester reopened to boat traffic on Friday, May 25 following extensive rebuilding of the towpath side wall of lock 15. The flight had been closed since the beginning of September last year. During the rebuild of lock 15, 63 new blocks of stone had been obtained from a nearby quarry at Kerridge to replace ones that had eroded or disintegrated, this fitting in with the lock flight being listed structures. Unfortunately as boat traffic started to navigate up and down the flight it was found that there had been movement of the walls of lock 11, just a bit further down the flight. 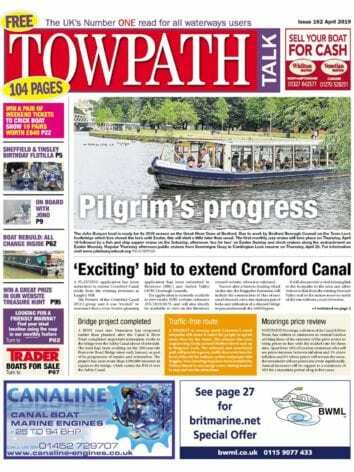 On Saturday, May 26 the Canal and River Trust issued an advice notice explaining to boaters that passage would be possible through lock 11, under supervision from CRT staff, between the hours of 10am and 4pm. A week later it was decided that the situation on lock 11 had worsened and so to prevent further issues and for safety reasons the flight was closed again. Work was done on the lock by moving some of the coping stones back and supervised passage through lock 11 is now possible, though there are width restrictions on boats over 45ft long. There will be no width restriction for boats up to and including 45ft (13.75m) long; boats that are over 45ft long with a beam of 6ft 9in or less should be able to navigate through the lock. The lock will be opened and supervised on a daily basis between 9am and 10am and between 3pm and 4pm. This is subject to change at short notice. This is the short-term action to keep the flight open, while work is ongoing to establish a plan for a permanent solution to the problems.